Tweet I’ve been a Dream Theater fan for a real long time. I’ve always thought Mike Portnoy was the best drummer of all time. When he left Dream Theater I was kind of shocked as was the rest of the Dream Theater fan base. However they got this new guy Mike Mangini who is just as good and a very interesting guy to listen to. After the interview I checked out the show near Chicago, IL and Mangini tore it up. I wish Mike Portnoy nothing but the best. I love Adrenaline Mob and am looking forward to his stuff with John Sykes. That said, Mike Mangini is the drummer for Dream Theater right now and I'm totally cool with that. He’s insanely good. 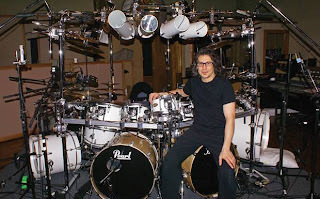 Check out my interview with Mike Mangini right here. Zoiks! : How has the transition into the drumming role of Dream Theater been? 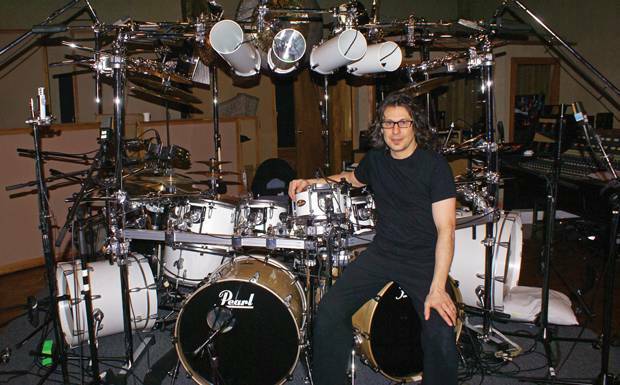 Mike Mangini: Natural, much like the audition that everybody can see in the documentary, it was a very natural thing. We like the same things, we see things the same way, so I guess it was really natural for everything to progress the way it has. Z! : The fan reaction seems to be varied. What have you noticed in terms of the fan reaction? MM: It depends on what you mean by fan reaction, because there are people who have seen the show and then there are people who have not seen the show, so you have to divide them into two distinctly different groups. A lot of times the people who haven’t seen it have more to say, but they haven’t seen it, so I don’t know what that is all about sometimes. The people that have seen it, by the third song they are making me feel so welcome that it has transformed everything for me to another level. It makes it that much easier because they have been overwhelmingly positive. It’s great. Z! : You mentioned people that haven’t seen the show. I think blabbermouth.net tends to be a big site where a lot of conversation is going. Do you think a site like that is good for the music industry, or does it hurt? MM: I’m not quite sure. There are different philosophies about this. I’m too busy with my life to spend time on the Internet. I’m busy doing something rather than talking about it, so I don’t know what that is like. There’s that aspect of it that I completely don’t know anything about that, because again I practice drums and I’m in a band, plus I have a family, so I’m busy. Then there is press. They say all press is good press? I don’t know. As long as people feel like they are expressing themselves and getting what they need out of their system, cool. Z! : What was your strategy with the audition process? MM: The root of this comes from stuff that’s natural. My strategy was basically to be myself. That means, what I usually do and have done in my life. When I come into a pre existing situation, I learn the music as it pre-existed. I never put myself above that and change the parts, although I’m evolving and doing somethings that are a little more personal recently. That’s always been my philosophy so I just stuck with what I always do. Z! : How big is your set on stage? MM: Well I have an octave of toms that I use because they have multi octaves on their instrument. So what I do is I divide…I associate three tom toms plus my snare or four tom toms with every one of their octaves, and it allows me to play things in the same frequency register. Everything has a purpose, everything up there gets hit, in some songs, everything gets hit. The only reason I know one Internet thing is because I was asked to look at an article about my drums so I had to go look at it. I was surprised at comments of people saying why all the drums or all the drums don’t all get hit. I mean they’re wrong, they get hit, what am I supposed to say? Z! : So much has been made about the set list being the same for the whole tour as opposed to when Mike Portnoy was here, it would change night to night? MM: The consistent set list is the way to go. It allows the crew to be consistent each night. It allows the transitions to be consistent. It allows us to get comfortable with the flow. For me I wouldn’t want to mix up the set at all, because I haven’t been in the band for too long. My past would dictate that just throwing songs in would be risky for the flow…it might be fun though, I don’t know, I’ve never done it. Z! : What was the recording process like. Did you get to bring a lot of your style to the process or was it more like they just told you what to do? MM: John Petrucci programmed the drum machine, which basically means kick and snare with some fills, so I would know where he’s feeling up and down or on and off the beat. It was a nice skeleton for me to work with. What I did was, I applied my drum set to that skeleton. Sometimes I played things completely different, but not too often, other times John asked me to try something different, other times we experimented with everything and went with what flowed the best. Z! : Were the songs completely written? MM: Yes, oh absolutely. I was busy putting my drum set together for this and going through the whole catalogue. Think about it for a minute, I am new in this band. Me being a composer right away was not a good idea. I didn’t want to do it; they didn’t want me to do it. I write music on instruments, on keyboard and stuff like that. Who am I to show up and write riffs with these monsters? I didn’t even try to do that. I also needed to configure my drum set based on the past catalogue. What if I showed up with a completely different drum set, recorded this record and then found myself ready to go on tour thinking oh no I need a high stack or I need octobons or I need this or I need a gong drum. I didn’t want to be in that position, so while they were composing I was working on the drums. Z! : I thought I read somewhere that when you tried out, you tried out on a drum set they set up, not your traditional set up. MM: That’s absolutely correct, I ended up setting it up, but the hardware was limiting, so I set it up differently than I’ve ever played a kit before. In other words when I sat down to do the audition, that configuration I’d never played in my life and I didn’t get to warm up on it either, so I just had to sit and do it. But that’s what I mean about this being natural, something inside just kicked in…it’s so much fun. Hey normally it’s possible that’d I’d be nervous in a situation like that, but with this I wasn’t. Z! : As a non drummer, who doesn’t really know anything about drums (both laugh) at what point…Dream Theater is a very technical band. Mike Portnoy is an amazing drummer clearly you are too. As a drummer at what point do you decide that you wanna go from a regular drummer to a virtuoso drummer? MM: You know what, that’s all to do with stuff that’s out of our control as human beings. Whatever you think that is, from body and spirit and emotion, psychology, I think these are things that are callings. People are attracted…some of us drummers are attracted to certain kinds of music; others are not attracted to certain kinds of music. I think everyone should try to listen to everything to try and see if it sparks in the brain. Eventually you have to follow your heart. Does that make any sense? Z! : Oh yeah I completely get what you’re saying. MM: I think it’s a calling. I think that the only thing that has to do with making decision are the unfortunate or fortunate things like, can you imagine all the people with a ton of talent who have no access to equipment or no freedom? Imagine how much joy we’re all missing out on if someone doesn’t have the opportunity, so I think that has something to do with it too. I know had to fight for everything. I had to wait for a little piece of equipment every Christmas and I’m lucky I got that (laughs). Z! : Dream Theater is a progressive rock band, but with in that genre they’re very eclectic. They can be very heavy and they can be very soft. As a fan are you more into the heavy side of music or the softer side? MM: Because I’ve spent times with so many types of music, it depends on my mood. Now mainly, if I’m going to play drums I like music with a lot of energy to it. So pretty much I like orchestrating on the drums with a heavy metal sensibility, that energy and that’s the band I’m in now. I’ve played full on Latin gigs. I love to play that music because it’s really high energy and as a drummer you can play things that are technically challenging and somewhat more fun. I’ve played full on jazz gigs in the last few years…just two of them, not many, but that has a sort of expressiveness to it yet you have to be so careful playing that to be quiet a lot of times and I don’t like to be quiet sometimes (laughs) so I like orchestrating on the drums with some energy which means pretty much Dream Theater to me. MM: Extreme and then Steve Vai, Missing Persons, Annihilator. Z! : How is playing in those bands been different from playing in Dream Theater? MM: Playing in Dream Theater, again this might come down to the drum set as well, as an expression of who I would like to be any way and a calling that’s inside me. My drum set fits this and it represent apiece of who I am musically. Each of those cymbols is structured with a specific frequency and has a purpose. Everyone of those drums has a purpose and you know something, for anybody that might read comments made by the small kit drummers and the guys that say, ‘oh so and so can play on a four piece kit.’ Well so can I, so can Marco Minnemann, Virgil Donati, so can Terry Bozzio so can all these players. They can play anything they want with a small kit. I really admire the guys with a creative imagination and the ones that just go for it, because it’s fun and don’t listen to those people that are criticizing you, trying to judge and all that. Again I’d rather be the person practicing my instrument rather than talking about someone else doing it. Which is probably why I appreciate all these players so much. For the record, I can sit there completely happy listening to Jeff Hamilton, a jazz player, playing on a four-piece kit all night long, or Jojo Mayer playing on a smaller type of kick. I enjoy listening to Steve Smith putting a few different knick-knacks on his drums, or Terry Bozzio going crazy. I just like it all. MM: The first influence would be Ringo Starr, Buddy Rich, Bobby Columby from Blood Sweat and Tears, Danny Seraphine from Chicago, Terry Bozzio, they’re all expressive drummers, you know what I mean. Those are my early influences, John Bonham. Z! : When did you first pick up the sticks? MM: Well I started performing when I was five…two to five hundred people. MM: They were weddings, once or twice a year or every other year or something…we have a huge family. I got the drum set that I used in those performances when I was four and I got like a paper skinned toy kit when I was three. I don’t know, what really counts, I mean how do you play when you’re five? I don’t know, I guess I did ok with the Ringo stuff, I don’t know. Z! : As a fan, was there a live concert that you saw that blew you away? MM: Absolutely, first…wait a minute, you know what, seeing Buddy Rich when I was nine that hit me. Then the first rock concert that I ever went to was the Rush “Hemispheres” tour. Then again I see this guy with all these instruments and all this percussion having the time of his life, why wouldn’t I want set up all kind of stuff and have fun.